More Info: Four embossed white panels showing images associated with Easter and Spring seem to float above the green, purple, blue, and orange background panels. The embossed images capture light and cast shadows making them seem as if they were carved into the card. Made in the USA. Inside: The joy of this beautiful season is like the joy of having a wonderful family like you to love and think about ~ a touch of springtime all year! More Info: Embossed artwork and pink foil lettering are the highlights of this Easter card for your daughter and her family. Inside: Easter is a lovely day, a joyous time of year For thinking of a family who are very close and dear ~ So naturally at Easter thoughts turn to each of you To send you warmest wishes and love for all year through. Happy Easter! Happy Spring! Inside: Sure hope Easter brings fun and surprises your way 'Cause a sweet niece like you deserves a special day! More Info: A generous amount of glitter covers the easter chick, egg, and flowers allowing this Easter card for your Niece to truly sparkle! Made in the USA. Inside: Blossom-bright, heart-happy, fun-filled, love-touched ~ that's the kind of Easter this wishes all of you from the heart. More Info: A sparkling glitter sun appears over pastel colored rolling hills in this Easter card for your son and his family. Glitter accents are found throughout the artwork including the flowers, leaves, rabbits, and along the outside border. The card is further enhanced by the use of green foil lettering and an insert with a coordinating image. Front: Happy Easter to My Brother - Easter is a time to reflect on nature's wonders and everything positive and good in our lives. Inside: It's the perfect time for me to say that having you as my brother means the world to me. More Info: A generous use of gold foil in the outer and inner frames along with the Easter basket contrast well with the soft blue eggs and purple flower on the front of this simple but striking Easter card for your brother. Also features an insert. Inside: Thank you for being the reason pride, joy, and tender memories grace that little Easter basket tucked in our hearts. You are both dearly loved. 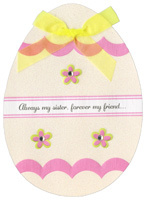 More Info: A generous use of gold foil in the outer and inner frames along with the Easter basket contrast well with the soft blue eggs and pink flower on the front of this simple but elegant Easter card for your daughter and her husband. Inside: A loving wish for all the joys that Eastertime can bring, And everything you're wishing for to brighten up the spring, With plans and projects you enjoy, good times to share, and fun ~ In short, the happiness deserved by such a special son. More Info: This Easter card for son features gold foil in the tree trunk and branches, gold foil lettering, and a thin embossed frame running along the outside edge of the card. Made in the USA. Printed on Recycled Paper. Inside: Hope your spring is full of swing, and your Easter's full of happy. Front: It's time for Easter fun, Daughter!